and how to see them all for less! What are the best Williamsburg attractions? Honestly, I used to think that Williamsburg was just the historic area. Go on the tour, see the people in costume, then move on to Virginia Beach. I was wrong. There’s so many attractions that you can easily make a week of it. In addition to Colonial Williamsburg with its Historic Area, the shops at Merchant's Square, and Duke of Gloucester Street, the town is packed full of attractions. There's the exciting Revolutionary City, spooky ghost tours, fantastic (and bargain finding and wallet boosting) outlet malls, the indoor waterpark at family-friendly Great Wolf Lodge, Busch Gardens, and Water Country USA, and even the best and most unique Yankee Candle store you've ever seen. Want to enjoy Williamsburg attractions, restaurants, and hotels for less? Don't miss my reviews and recommendations below to find free things to do, coupons, discount tickets, cheap restaurants, and more. Of course, you'll want to start with the Colonial Williamsburg Historic Area, often voted one one of the best historic sights in the US, as well as a don't-miss sight for seeing with your kids. 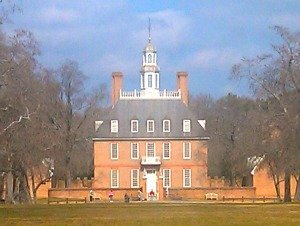 Don't miss my "Secrets of a Cheap Colonial Williamsburg Vacation," for free things to do, coupons, discount tickets, cheap restaurants, and more. (You'll even learn about my top 6 spots to see at the Historic area, and how to save on admission). Ever had a secret desire to join a mob? Debate politics with Thomas Jefferson or George Washington? Go back in time to see what things were like during the American Revolution? It just takes a little imagination and a ticket to Colonial Williamsburg’s “Revolutionary City.” A street theater production that brings history alive, Revolutionary City debuts March 15th for the season runs through the fall. For details on Revolutionary City, click here. It's been voted the world's "Most Beautiful Theme Park" for 19 consecutive years, won “World’s Best Theme Park”, and regularly get 1st place for "Best Landscaping" and "Most Beautiful Park." Plus, it's home to Griffon, the world's longest, floorless dive coaster, "Verbolten," a Zierer, multi-launching steel roller coaster (almost lost my hat on that one! ), and the new "Tempesto." And I literally spend hours each month scouring the web for the best Busch Gardens Williamsburg discount tickets deals. Here's the latest deals. Here's a place where the weather's always a perfect 82 degrees...even during a tornado. This 55,000 square-foot indoor waterpark/resort boasts six pools, eight waterslides, a four-story interactive waterfort, and Howlin' Tornado--a six-story "extreme" tubing ride. Maybe the strangest of the Williamsburg attractions, this quirky museum is home to the infamous Frosted Flake shaped like the state of Illinois. You know, the one that was auctioned off on Ebay? Chesapeake's Melissa McIntire sold the funky Frosted Flake to TriviaMania.com for a whopping $1350! Now it's at Ripley's. If you like a haunted atmosphere while you dine, check out the Haunted Dinner Theater. Located in the back of Captain George's Restaurant (renowned for in both Williamsburg and Virginia Beachfor its 71-item all you can eat seafood buffet), the Haunted Dinner Theater is an "interactive and audience participatory diner theater experience." Haunted Dinner Theater operates March through October. Tickets start at about $47 for adults and $30 for children 12 and under (4 and under are free). For tickets, call 757-258-2500 or go to www.haunteddinnertheater.com. Captain George's is located at 5363 Richmond Rd. on Route 60 West. To be honest, I've never been on one of the many ghost tours here. But I hear that these Williamsburg attractions are a fantastic treat for all ages (especially at Halloween) and a great way to enjoy an evening. Plus, kids under 6 are usually free! There are several groups to choose from (plus one in nearby Yorktown). Here are details about area ghost tours, plus a link to a photo of a "real" ghost supposedly snapped while on one of these tours. This is a true shopping mecca. In fact, the outlet malls of some of the best Williamsburg attractions. You can spend days just looking for bargains. But frankly, some of the malls aren't necessarily worth your time. Here's an overview of the area's shops, including which ones to avoid, and indepth reviews of our favorites: Prime Outlets and the Pottery. 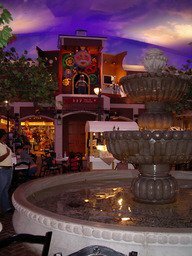 And for something a little different, don't miss Yankee Candle, kind of like the Disneyland of candles (it even "snows" inside). Our kids insist on stopping there whenever we're in Williamsburg. What are the best-rated Williamsburg restaurants? Readers of The Virginia Gazette have cast their annual "Best Of" votes. Readers voted in 90 categories. Old Chickahominy House won for "best soup," while Sal's by Victor won for both best Italian restaurant and best pizza. Berret's won for "best crabcakes." But we think we've found the two best dining bargains near Williamsburg attractions, eateries where your dollar goes a l-o-n-g way...without sacrificing taste. For the best Williamsburg restaurants...and our two favorite cheap deal hot spots near the main attractions, click here. Culture and pampering have their places here too. Kingsmill Spa is a located at the breathtaking Kingsmill Resort, and is renowned for its relaxating massages and spa treatments. Here's how my mother-in-law described her day at the spa. If plays by the old Bard are your game, the Virginia Shakespeare Festival hosts fabulous Shakespeare productions (like Romeo and Juliet) at its world-famous summer festival. Where to stay after visiting Williamsburg attractions? The area has lots of fabulous hotels (including the famous Williamsburg Lodge), but if you want great lodging with out breaking the bank, there are some fabulous local campgrounds, including the renowned Williamsburg KOA, which has its own stop on the Historic Triangle shuttle, and is near to Busch Gardens and Water Country USA. And they have great deals, as you'll see here!